This worksheet is really a giant, graphical matching problem. 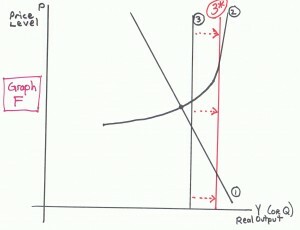 Below are 6 different graphs, labeled Graph A through Graph F, of the AD-AS model. 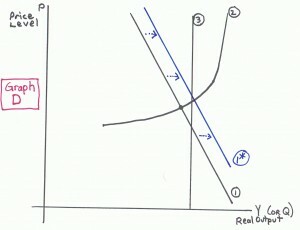 The black lines represent the original condition of the economy. The curves are labeled 1, 2, and 3 instead of AD, SRAS, and LRAS. You should be able to identify which curve is which by its shape and location. Notice that it is not at a full-employment equilibrium. The black lines are the same in all 6 graphs. 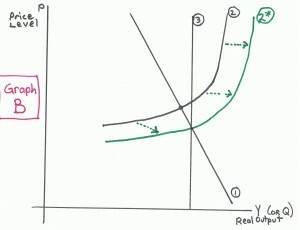 Each of the 6 different graphs also shows a fourth curve in color (blue, green, or red) that represents a shift in one of the major curves. The shifted curve is shown as either 1*, 2*, or 3*, and the shift is further emphasized by arrows indicating the direction of the shift. 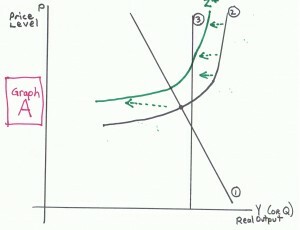 Following the graphs are ten statements that describe a change or event in the economy. 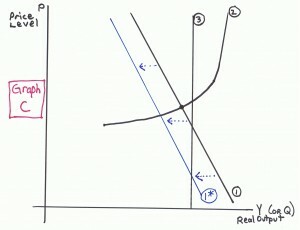 Your task is to match each statement with the graph that represents that particular event or change. As always, you should submit your answers in the Learning management system for your school (D2L at LCC)..
Short-run aggregate supply has increased. 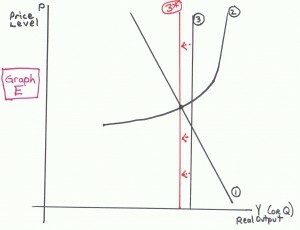 The quantity of real goods and services demanded in aggregate has increased at all price levels. Long-run aggregate supply has decreased. Tax rates on businesses have been reduced, resulting in greater profitability at existing sales prices. Businesses are more willing to produce in the short-run. A series of natural disasters (typhoons, tsunami’s, and a nuclear plant meltdown) have destroyed a significant portion of the economy’s factories and made significant farm land unusable. In an effort to stimulate the economy, the government has reduced payroll and income taxes on individuals. Households spend most of the increased after-tax income. There is a major financial crisis on Wall Street and the stock market. As a result, bank lending has been severely reduced. Consumers, finding it difficult to get loans, reduce their purchases of autos, new houses, and vacations. Businesses cancel expansion projects when they can’t get financing, and instead, they pay down debt. A war breaks out between Iran and the US. As a result, the supply of imported oil to the US, a critical resource in the economy, is drastically reduced. Crude oil and gas prices skyrocket causing businesses’ expenses to increase as they spend more these critical inputs (consider only short-run implications). In response to what the government believes is a major terrorist threat, the government dramatically increases spending on the military and homeland security.